February is about the time when spring fever gets a hold on me. I really miss my gardens here in my cold climate of Northern Colorado. Rose and plant catalogs are coming in the mail, feeding the flames of my spring fever. 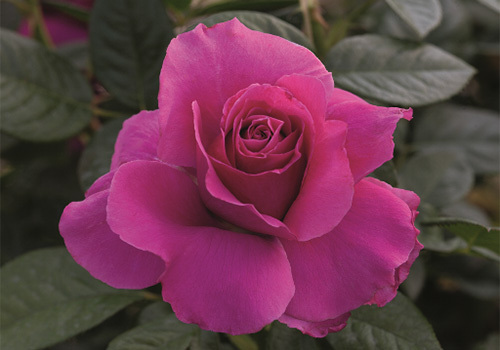 One delight is to see all of the wonderful new rosebushes coming out for sale. Weeks Roses have been a favorite of mine for years. Their Betty Boop rosebushes have been favorites, with bloom smiles that seem to call out to a person from across the yard! The new introductions for 2016 are true delights as well. 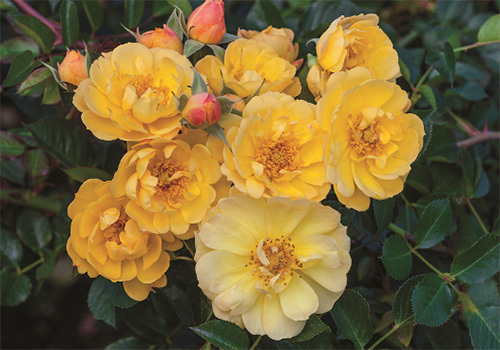 Sure to be a favorite is the new shrub rose in the Home Run line of rosebushes, appropriately named Watercolors Home Run. 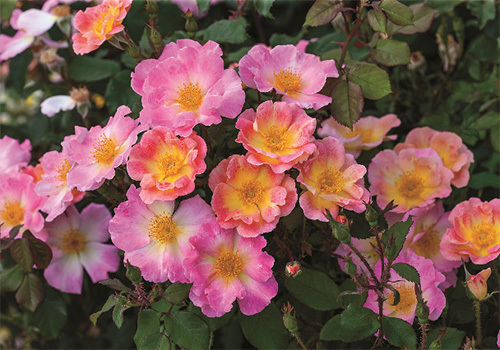 These bloom smiles have a sunny yellow center that is encircled by pink. The honey bees love her in my rose beds nearly as much as I do. She seems to be in bloom all season long! Weeks is introducing a new miniature rosebush named Cutie Pie. As her name implies, she is a cutie indeed. Her peach- and yellow-blend bloom smiles with just the right highlight of pink makes this old rosarian’s heart fill with joy. She is indeed coming to my rose beds this season! There are new ground cover roses as well. Rainbow Happy Trails and Sunshine Happy Trails are a delight. In their first year in my rose beds last year as test roses, they outdid themselves! The blooms on Rainbow Happy Trails remind me of Watercolors Home Run with similar coloration and fullness of the blooms. The amount of blooms was like a beautiful carpet. The same is true of Sunshine Happy Trails, except that it is a gorgeous shade of yellow that gives a special glow when kissed by the sun. 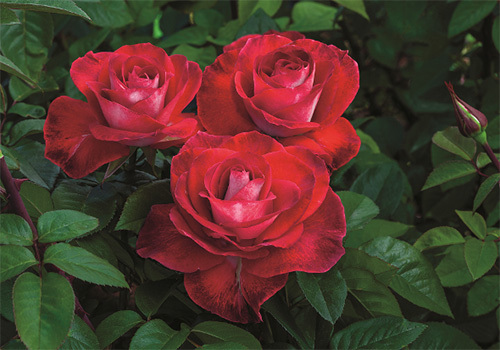 Two new hybrid tea roses very appropriately named Pretty Lady and Smokin’ Hot will make rose lovers giddy with delight. Pretty Lady has amazingly deep pink blooms that are nicely fragrant and even has that old fashioned rose flare to her bloom smiles. 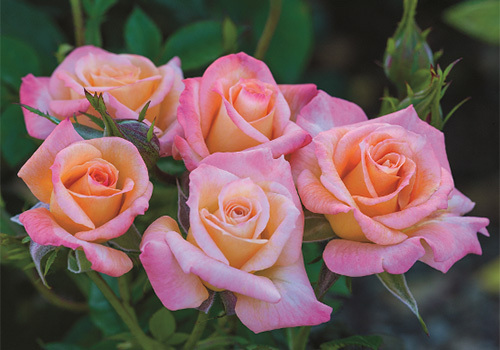 Smokin’ Hot, with richly-colored, fiery orange blooms with just the right touch of purple “smoke” set off with her white reverse, will bring eye-catching beauty to your garden for certain. 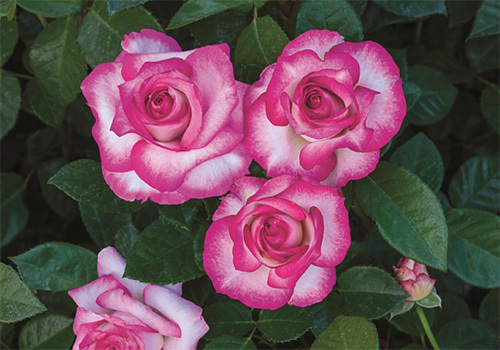 The new grandiflora rosebush is the stunning Miss Congeniality. Her white- and pink-edged bloom smiles are truly captivating. She consistently bloomed nicely for me last season as a test rose. This is a rosebush to meet up close and in person. I assure you that the name is more than fitting. She, too, has that special eye-catching beauty to her bloom smiles that makes you want to take her picture to enjoy all winter long. While enjoying the new roses and catalogs this time of year, it is a good idea to check the soil moisture in your gardens and rose beds. If you have had some good snows or rains, depending on where you live, then they may be okay. Hopefully you have been checking soil moisture every so often anyway, but it is a good idea to check it now. 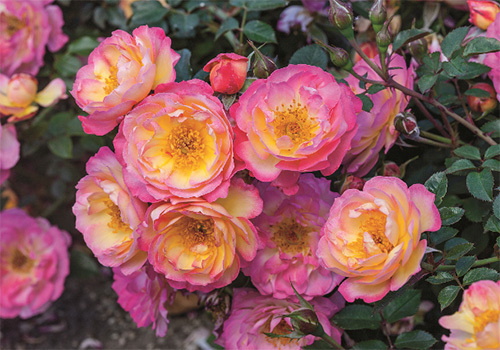 Soil moisture carries strength-building nutrients to the roots of our roses, plants, trees, and shrubs, making the difference between a glorious spring into summer show, or just a so-so start and overall season. Enjoy your gardens and always remember that the best growing gardens do so with the shadow of the gardener in them.